With WWDC around the corner, iOS 6 rumors are coming in waves. 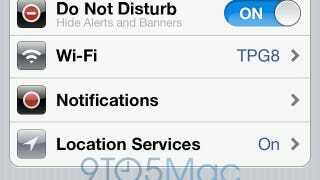 9to5Mac is reporting that iOS 6 will have a super useful 'Do Not Disturb' feature, iCloud Tabs and Mail VIPs. Do Not Disturb looks especially useful, as it would be able to hide all alerts and banners from taking over your phone while you're playing a game or just don't want to be bothered. All the features hail from Mountain Lion, Apple's next desktop OS and tie themselves neatly with iCloud. iCloud Tabs is a simple way to keep various versions of Safari (desktop, mobile) in sync, when you open iCloud Tabs on your iPhone, you'll see a list of tabs you have open in Safari elsewhere. Mail VIPs are just a simple star next to very important people who send you e-mails. Potentially useful in helping you quickly sift through your e-mails.